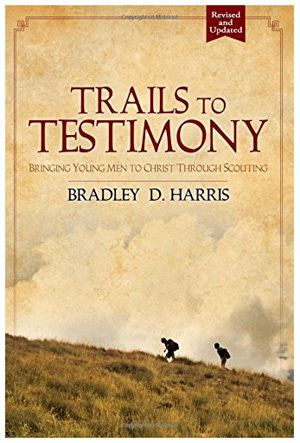 I just read Brad’s Blog about the study Baylor recently conducted to further illustrate the value of Scouting and its impact on society. Similar to the “Values of Americans” survey that shows a direct connection between a Boy Scout and his personal values over a lifetime; this scientific study focuses more specifically on the additional benefits a young man can obtain by earning the rank of Eagle. Eagle Scouts exhibit higher levels of participation in a variety of health and recreational activities, such as regular exercise, outdoor recreation, attending plays and live theater, reading books, playing a musical instrument and visiting a local, state or national park. Eagle Scouts show a greater connection to siblings, neighbors, religious community, friends, co-workers, formal and informal groups and find a spiritual presence in nature. Eagle Scouts share a greater belief in duty to God, service to others, service to the community and leadership, such as donating money to an organization or charity, volunteering their time, working with neighbors to address a problem or improve something, voting in the last presidential election and holding leadership positions at a workplace or local community. Eagle Scouts engage in behaviors that are designed to enhance and protect the environment, such as being active in a group that works to protect the environment, avoiding the use of certain products that harm the environment and using less water in their households. Eagle Scouts are more likely to be committed to setting and achieving personal, professional, spiritual and financial goals. Eagle Scout show higher levels of planning and preparedness, such as having a disaster supply kit in their home and emergency supplies in their car, designating a specific meeting place for family during an emergency and being CPR certified. Eagle Scouts are more likely to indicate that they have built character traits related to work ethics, morality, tolerance and respect for diversity, such as always exceeding people’s expectations and doing what is right, working hard to get ahead, treating people of other religions with respect, strongly agreeing that most religions make a positive contribution to society, stating that respecting religious leaders outside of their religions is somewhat important and showing respect to the American flag. In summary, Eagle Scouts exhibit significantly higher levels of health and recreation, connection, service, leadership, environmental stewardship, goal orientation, planning, preparedness and character when compared to other Scouts and non-Scouts. 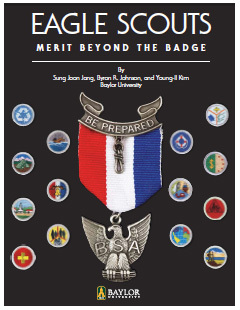 “We found that the effort and commitment required to earn this rank produces positive attributes that benefit not only these men in their personal and professional lives, but also benefits their communities and the country through the service and leadership they provide,” said Dr. Byron Johnson, lead researcher, Baylor University. So once again, does living by Scout principles and working to earn BSA’s highest rank really make a difference? My response should be no surprise… YOU BET IT DOES!! Full details of this study can be found in the attached printer-friendly PDF file. Source: Baylor University (2012, April 10). In the context of this study, “Scouts” refers to men who were in Scouts as youth but did not reach Eagle, while “non-Scouts” are men who were never in Scouts as a youth. 2012 marks the 100th Anniversary of the Eagle Scout award. This entry was posted in Eagle Scouts and tagged baylor university, boy scouts, bsa, bsa survey, eagle rank, eagle scouts, research, scientific study, values of americans. Bookmark the permalink.